Send and receive orders throughout the United States, Canada and Puerto Rico, as well as internationally. 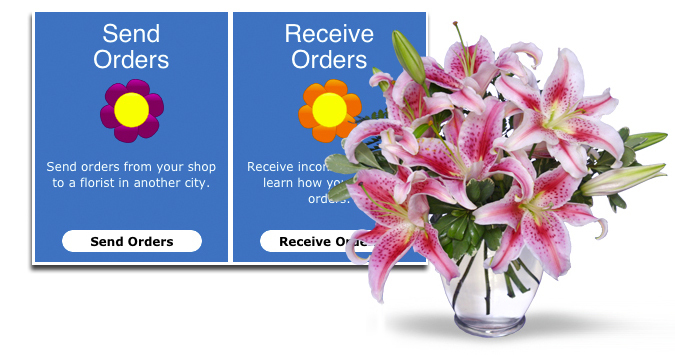 Our easy-to-use system even allows you to choose your preferred florist. Pay only a low transfer fee if or when you send. Get a min. 80%* when you fill an order, sending florist keeps 20%. FSN does not take a cut. *All shops get paid weekly for orders filled. US shops can have funds deposited in their back within 72 hours. Call for details – 800.858.9925. You have the option of sending and receiving orders at 80%, 90% or 100%. Receiving florists are always paid at least 80%, not 70% or 73% like wire services. Hundreds of professionally-designed floral arrangements and designer recipes are at your fingertips exclusively online at FSNf2f.com. No specialty containers used. With our network, you will have quick and convenient access to contact information for funeral homes and hospitals across the United States and Canada. Receiving florist gets minimum 80%* of the order price; the sending florist receives 20%. *Only pay a low transfer fee of $4.99 for US and Canadian orders. for a total of $44.99. *$4.99 per order for online order transmission via www.FSNf2f.com. Phone-in orders are $7.99 per order. Added bonus: No transfer fees for your FIRST 5 ORDERS! No haggling..., just flowers. So far only real florist! I just ditched the last wire service. I am feeling so relieved and excited about the money I will save. — Heather P., Heather's Flower Shop in West Dover, VT. Receive Your Orders, Your Way. For More Money in Your Pocket?